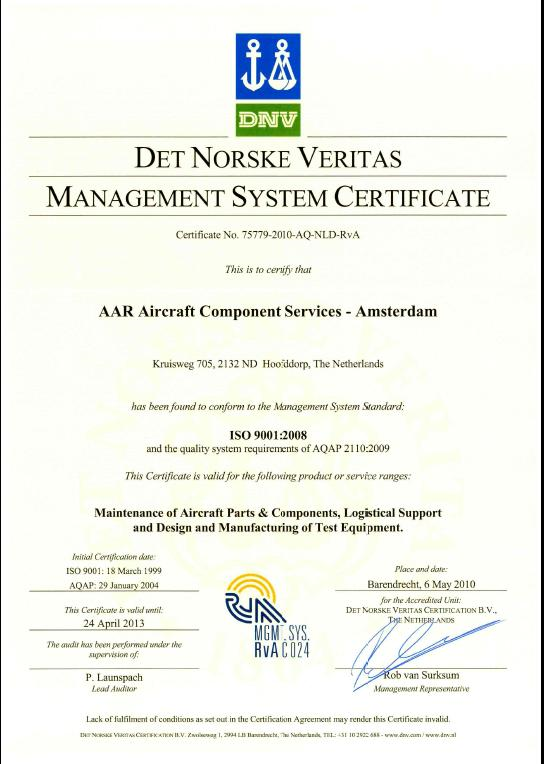 AAR Aircraft Component Services Amsterdam in Hoofddorp, the Netherlands, specializes in overhaul, repair and maintenance of aircraft components. In the military field the company has built up an extensive experience in servicing components of the F16 fighter aircraft for air forces in Europe, the United States and other F.M.S. customers. But also other aircraft type components like for the C130, Chinook Helicopter, various transport aircraft and helicopters are being serviced. 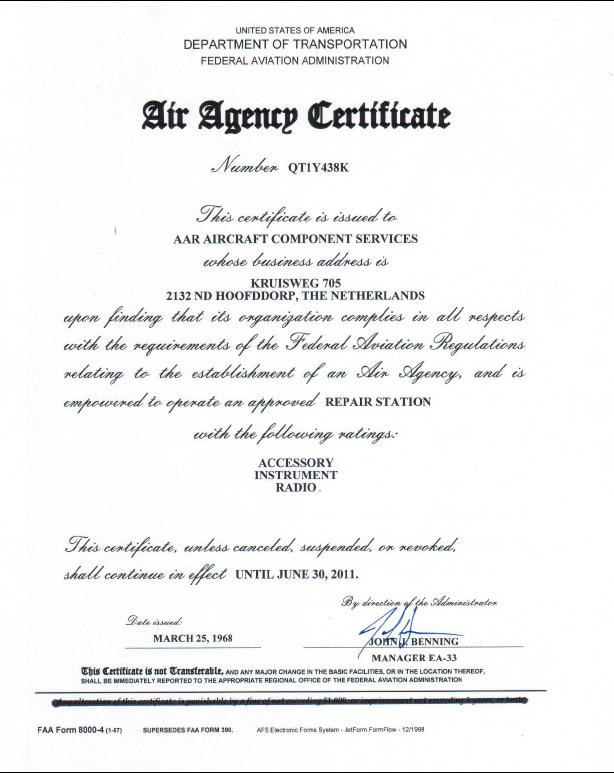 In general AAR inspects, repairs, overhauls and tests pneumatic components, hydraulic components, electric and electrical components, fuel components, mechanical components and instruments. 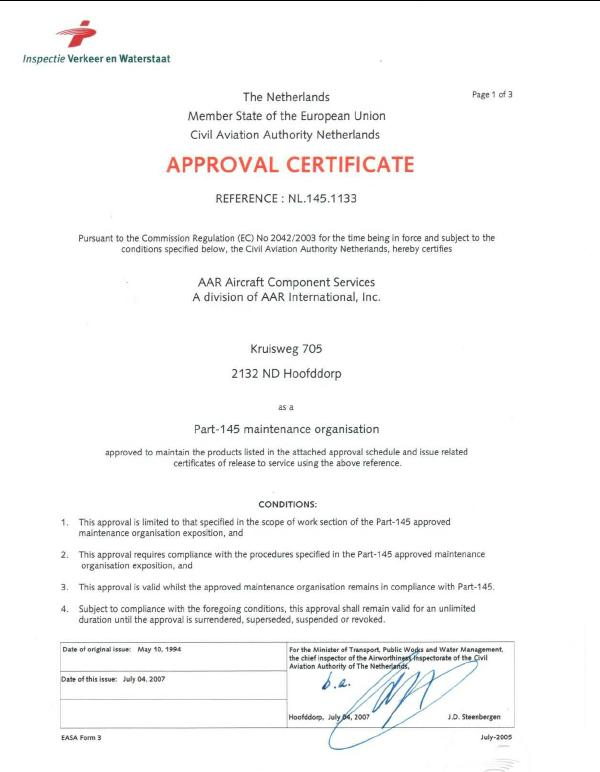 F16 components serviced by AAR include the Jet Fuel Starter, the Accessory Drive Gearbox, the Emergency Power Unit, the Convergent Exhaust Nozzle Control System, and the Power Take Off shaft. 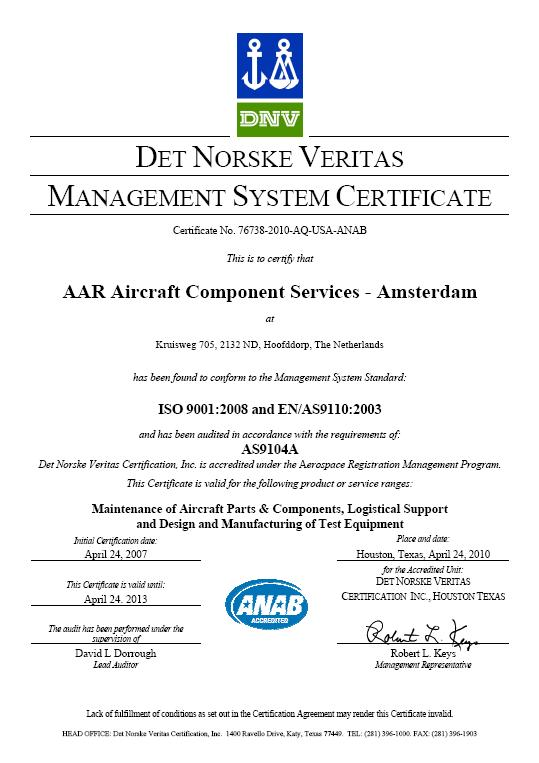 Also AAR designs and manufactures complete test stands for above components, and supplies those with training for engineers and complete spare packages. Universal hydraulic and fuel test stands, generator test stands, electrical test stands have all been designed tailor-made and supplied to customers worldwide. 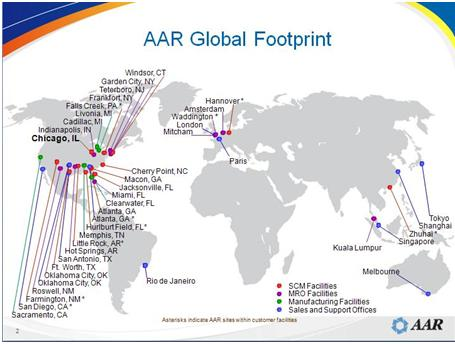 The total AAR group are 33 companies in the U.S.A., Europe and Asia Pacific, active in manufacturing, trading and servicing for the aircraft market and defense organizations. Also financing and aircraft trading and leasing belong to the activities. Totally the company has two million square feet operating space. 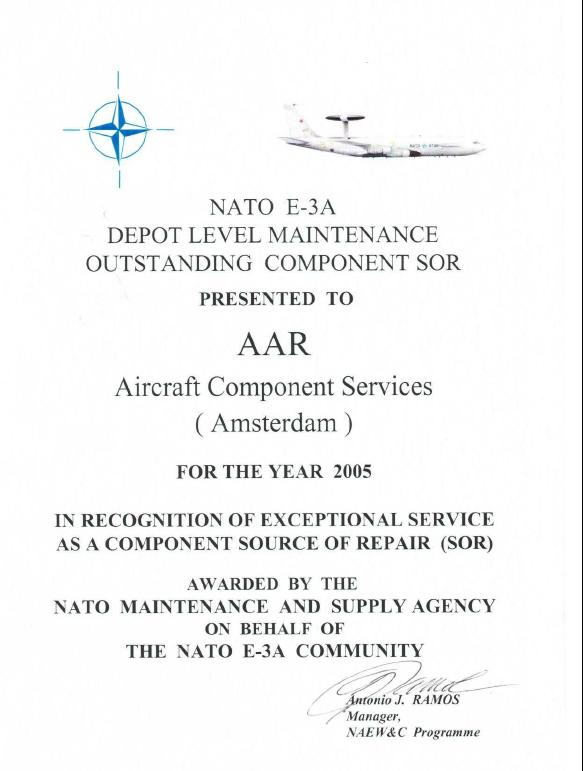 In addition to AAR in Hoofddorp the total group overhauls and repairs airframes, landing gears, cockpit instruments and avionics, hydraulic and pneumatic components, and repairs and refurbishments of engine components. 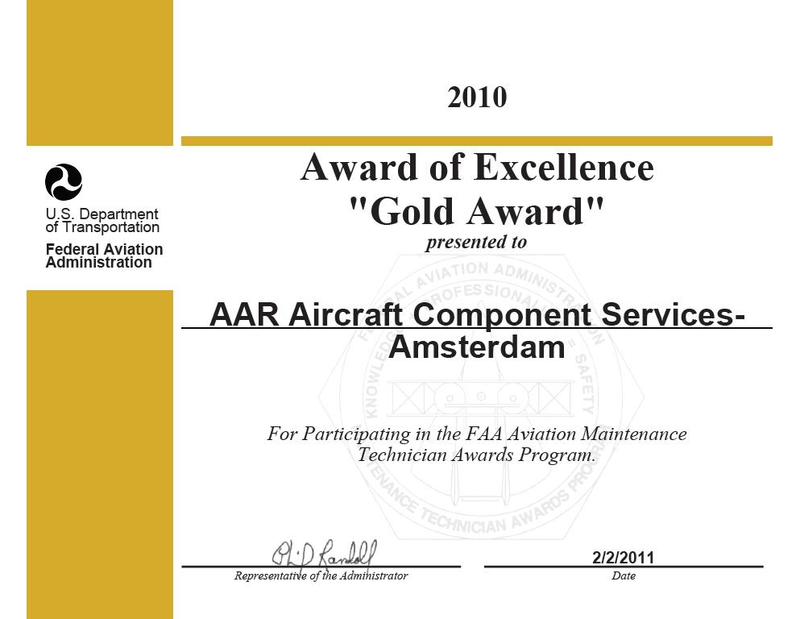 This puts AAR in a position to offer complete custom-designed maintenance and logistic programs whereby one of the companies can act as a single point of contact to service complete component packages for an aircraft thereby relieving procurement organizations from the burden of having to deal with many different vendors. 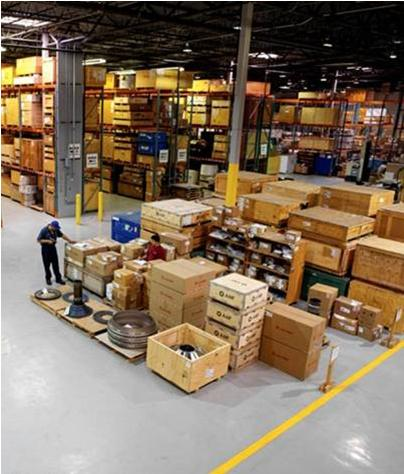 AAR provides high-quality aircraft and engine parts supporting a broad range of commercial, regional and military operators and offers a full range of related parts services including just-in-time delivery, parts exchange and end-to-end supply chain management programs. 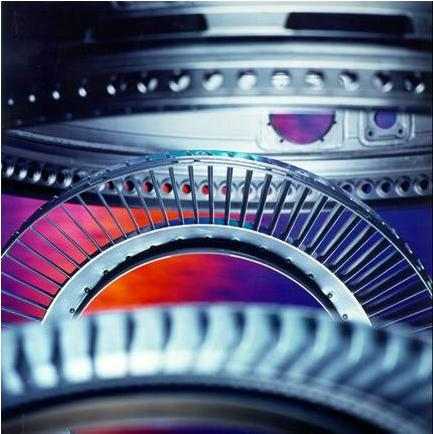 Largest independent supplier of aircraft engine components and inventory management. Only FAA approved, fully traceable products used.